Hello friends! It has been 3 months since my niece Kaycie suffered a traumatic brain injury as the result of a horrible car crash in Pennsylvania. She remained in critical condition on life support for nearly 2 months. Our family feared at one point we may lose her. I am pleased to say that she has made an amazing turn for the better. She was weened off the ventilator and is awake and aware. Her tracheotomy has finally been removed and she is able to speak to us. We are incredibly happy that she was stable enough to be transported back to CT! She has begun long term rehabilitation working on the many challenges this bilateral brain damage has caused but we are confident she will remain the strong woman that she is and push through. 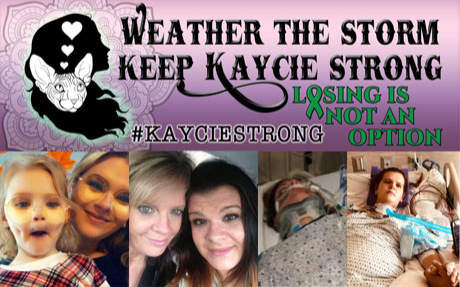 We, Kaycie's family, have created this page and will maintain it in an effort to raise money to help with the astronomical medical bills and offset the personal expenses that continue to arise. Thank you so much for helping our family in this time of need, your care and concern are greatly appreciated. A huge thank you for all of you that have reached out with donations, prayers, kind words and much love! I will continue to update you all with her progress and please continue with your positive affirmations and words of encouragement they are more helpful than you know. With love and prayers from the staff and parents of Buttons 'n Bows Preschool and Daycare. My prayers are with Kaycie and her daughter; may she have a speedy recovery. God Bless! Additional donation from the Woodbridge Social team. My prayers are with Kaycie, her daughter and the entire family. May God see her through.